Boscotek wall mounted panels are the ideal solution to organised wall mounted tool and equipment storage. It’s no secret the leaner and more efficient your workshop production is, the greater chances are of a more profitable business. Successful industrial workshops in the automotive, defence and manufacturing industries are adopting a ‘5S’ approach to their production processes. Boscotek products are perfectly matched with this strategic way of operating which is why we have introduced our new VTS range of workshop storage products. Wall mount panels are simple to attach using the slimline mounting posts. Slot in combinations of both perforated and louvre panels to form any arrangement. 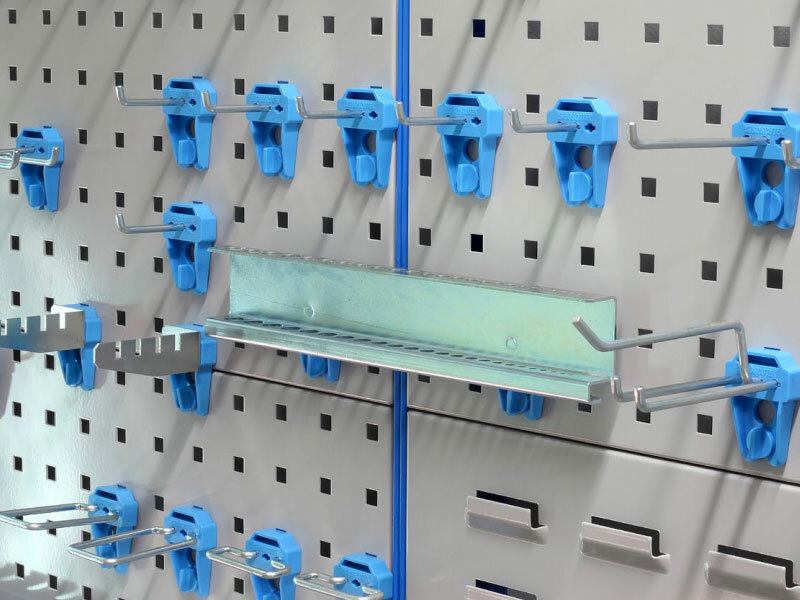 The modular panel system can be stacked side by side with no loss of mounting space, meaning Boscotek Twist and Lock Tool Hooks can be mounted across panels, giving you the largest usable area. From garage workshops to mine sites, Boscotek wall mounted panels are sure to be an effective storage tool keeping your workshop organised and productive. 1.2mm zinc seal steel perforated panels accommodate Boscotek Twist & Lock Tool Hooks. Strong durable design for workshops. Large surface area of perforation. Perforated pitch array gives maximum surface area of any panel. Store more tools with greater surface area. Hooks can fixed over adjoining and stacked panels without loss storage space. Intelligent design of mounting posts and panels allows more storage surface area for tools and equipment. Hooks can fixed over adjoining and stacked panels without loss of storage space. 1.2mm zinc seal steel louvre panels accommodate standard plastic bins (not supplied by Boscotek). Greater use of wall space. Intelligent design of mounting posts provides clean and strong mounting to wall. Available in 600, 900 & 1200mm high. Reduced depth and aesthetic flush appearance. Panels can be stacked with no loss of space. Fix using keyholes for greater usability. With the Wall Mount Panel System, tools and equipment are organised and neatly stored above the work top area with the use of varying sizes of hooks, holders and hangers. The simple lock and twist design means these tool hooks can be relocated and locked into place from the front with ease. 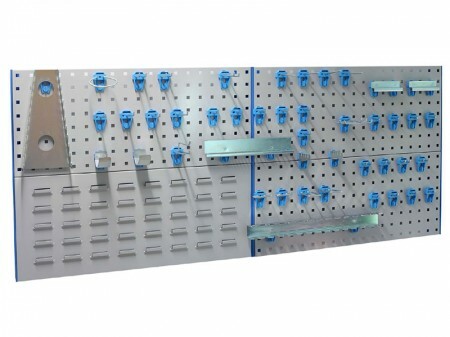 With the Wall Mount Panel System, tools and equipment are organised and neatly stored above the work top area with the use of varying sizes of hooks, holders and hangers. The simple lock and twist design means these tool hooks can be relocated and locked into place from the front with ease. Twist & Lock Tool Hooks are sold in kits.